You can’t live without eggs can you? I Cant. I’m open to all kinds of eggs and methods of cooking the egg but my favorite kind of egg will definitely be those with a molten yolk. That is why I really love poached eggs or Tamago eggs since they fit the bill of my “ideal” kind of egg. I don’t pay so much attention to scrambled eggs ( unless they are creamy) or sunny side up ( They just look pretty on the plate hahas). 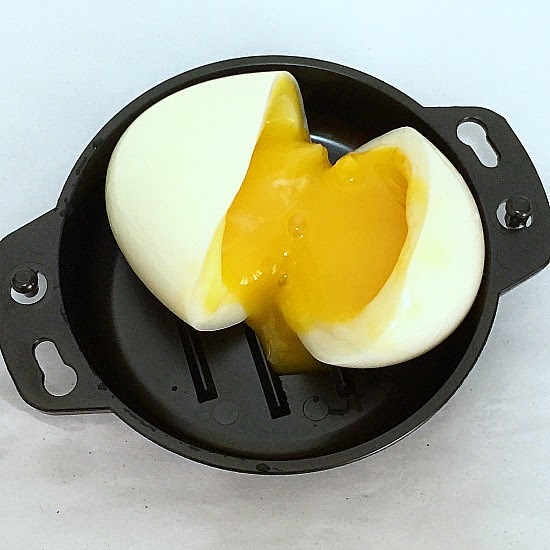 You can create your own runny yolk boiled egg from just a simple pot of boiling water and ice bath. Boil a pot of water. Add eggs ( not too many to prevent overcrowding). Boil for 6 min ( I used 69-72g sized eggs) for 6 min and it turned out perfect. After 6 mins Is up quickly remove the egg and shock the egg in a bowl of ice water to stop the egg from cooking in its shell any longer. When egg is cool, peel the shell and enjoy 😉 Remember to egg-xercise self-control when consuming. ( I had 3 eggs because I didn’t want to waste boiling a pot of water just for an egg- OPPS).